Cherry blossoms in full bloom. Photo by Karen Blaha/Flickr. Washington, D.C., is blooming. Here's a solid game plan for exploring the nation's capital. Washington, D.C. is a place we tend to think of more for marches and class field trips than personal bucket lists. But there are many interesting things happening beyond the open expanse of the National Mall and the broad swath of patriotic Smithsonian museums. In recent years, the city has been shedding light on the patchwork of diverse stories and narratives that make up America, perhaps in a way that only the nation’s capital can. National Art Gallery's Sculpture Garden fountain. Image by Jeff Gunn / Flickr. Early each spring (late March through mid-April), Washington explodes in a riot of pink, and tourists descend upon the District for the annual Cherry Blossom Festival. 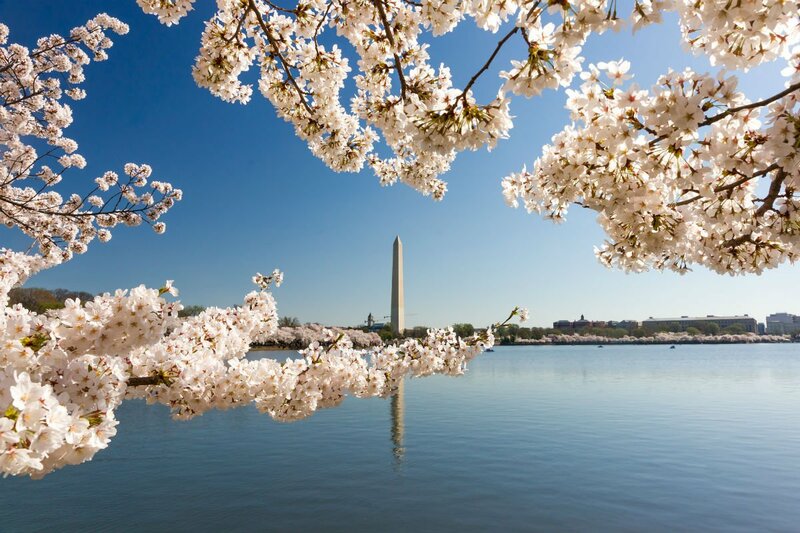 The flowering trees first arrived in D.C. in 1912 as a gift from Tokyo mayor Yukio Osaka. It took the coordination of many to ensure the safe transport of the trees from Tokyo to D.C (an original shipment of 2,000 trees in 1910 perished in transport). When the trees did successfully make their American landing — thanks in no small part to Eliza Scidmore (first female board member of the National Geographic Society) and First Lady Helen Herron Taft — they were planted along the Tidal Basin. While scattered throughout the city, the Tidal Basin, now the site of the Jefferson Memorial, remains the most picturesque place to take in the blossoms’ full grandeur. This landmark museum — the newest Smithsonian opened in 2016 — is devoted to the exploration of American history through the stories and lens of the African American experience. This long-overdue institution has already welcomed more than 2.5 millions visitors since its opening. The monumental collection of more than 36,000 historical and cultural artifacts is worthy of a multi-hour visit, and, while tickets are free, they hard to come by and require advanced reservations. As any visitor to the Portrait Gallery’s Presidential Gallery is well aware that, with the exception of Chuck Close’s overbearing Bill Clinton and Elaine de Kooning’s vivid JFK, the walls are mostly blurs of black and gray interior scenes. So when the colorful, out-of-the-box Obama portraits were unveiled in February, the normally ho-hum affair received a lively response — the world responding to art. Visitors can now pay homage to President Obama's portrait in the Presidential Gallery and Mrs. Obama’s portrait in the 20th Century Americans Gallery. There are long lines for those who wish to stop and linger, but taking in the work of Kehinde Wiley and Amy Sherald, the first African-American artists to paint official presidential portraits, is significant. And while you won’t need to wait in a line to see it, an inspiring exhibit devoted to the life and legacy of actress Marlene Dietrich, who pushed gender and sexual boundaries, is a must-see. Also worthy of a visit is a small room devoted to the short and tragic life of poet Sylvia Plath, one of our country’s great literary minds. 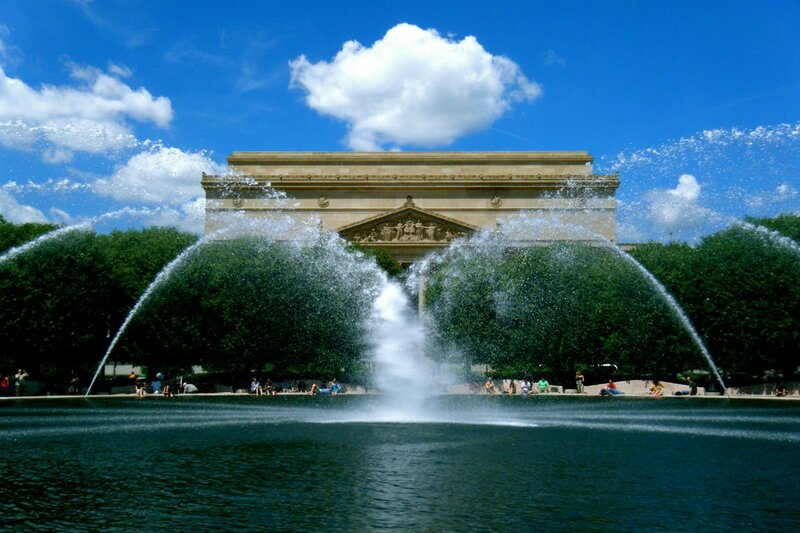 This stalwart of the National Mall has a vast collection that is always worth a visit. The museum is garnering new attention for the Outliers and American Vanguard Art exhibit. Consisting of self-taught (also referred to as folk or primitive) artists in America over the last several centuries, the show is a compelling dive into the power of the creator. Devoted entirely to unpacking the First Amendment and examining the history of the free press, the interactive museum is designed to prompt visitors to examine the role the free press plays in their lives — something ever more necessary in today’s era of “fake news” and social media and evolving dialogues. At once D.C.’s oldest and newest neighborhood. Chock-full of construction and glass and steel condo towers, it’s also home to some of the oldest fish markets in the city. On warm weekend days, the Wharf is flooded primarily by locals who stroll the handsome boardwalk or stop for alfresco drinks by the water. Part cafe, part bookstore, park community gathering place, the shop first opened in 2005 by an Iraqi-American artist and activist and has now grown to six locations throughout D.C. Driven by community activism, Busboys and Poets hosts a full range of events, from science talks to poetry open mics. It draws its name from Langston Hughes, who worked as a hotel busboy in the 1920s before gaining recognition as one of America’s greatest 20th-century poets. Another hybrid bookstore, cafe, restaurant, and bar located in Dupont Circle. Kamer’s is always full of people browsing the shelves, sitting down for a full meal, or just stopping by for a glass of wine. Who said print was dead? 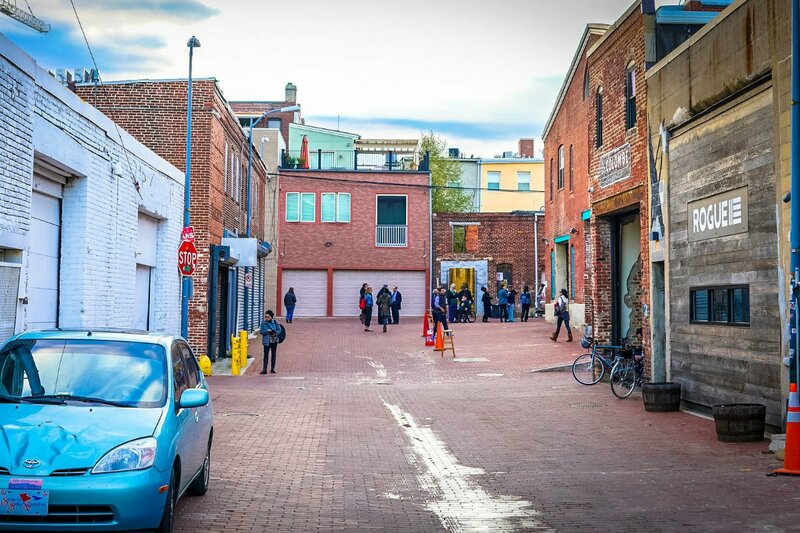 Enjoy food, drink and local graffiti at Blagden Alley. Image via Ted Eytan / Flickr. Approaching Bladgen Alley, you might think you’re entering a zone reserved for a large box factory or a coffee roasting facility. But this slice of the hip Shaw neighborhood is an enclave of murals, coffee shops, one of D.C.’s top cocktails bars, and more. Totally unassuming from the street, with back-meeting alleyways and interior corridors overtaken with eclectic murals and choice graffiti about the current administration. The area has gone through rapid gentrification over the past twenty years, and a sparse but buzzy La Colombe cafe is the crown jewel to show for it. Even though the Alley became a National Historic Site in 1990, stumbling upon it still feels like uncovering one of the city’s best kept secrets. Come back in the evening for cocktails at the Columbia Room, arguably one of the District’s best cocktail bars. It's a bit threadbare, and the cushions are definitely sagging, but there is something so very un-D.C. about Dupont Circle’s Tabard Inn. Primarily an inn for overnight guests, the ground floor is a cozy living room with a roaring fireplace that feels like a throwback to another era. It’s the kind of place where you could have a hot toddy with an old professor or a martini alone with a good book. This spacious yet always packed Logan Circle joint offers an impressive list of brews and accompanying high-end pub fare. Like most everywhere in D.C., the crowd is a mixed bag of frat kids and diplomats joined in the shared mission of finding the perfect beer in a place that feels like anything but a dive bar. Located above the restaurant Birch & Barley, it is dark and welcoming. Claiming a table may require some professional negotiating skills. One of the District’s most romantic spots is in a covered carriageway. The Italian and Greek cuisine may transport you to the the Mediterranean, but the ambiance is far more reminiscent of the South. Here is a place to linger over candlelight and sumptuous cocktails. Not just a take on a Lyon bistro, it’s an improvement on one, as if you’ve stumbled upon some bizarre drop-in from France and you’re not sure exactly how it got there. The eatery is charming, cavernous, and delicious. Stay for mussels by the bucket at one of the red and white checked table-clothed tables or try fries with a few appealing sauces and wine at the bar. Ask a local where the cool kids live, and they’ll inevitably tell you Mount Pleasant. With a distinct Berkeley, California, vibe of grunge-meets-gourmet, the area has a sense of remove from the rest of the city, yet is still fully accessible by Metro and just a short walk from both Rock Creek Park and downtown. The cafe on the main drag, Mount Pleasant Street, is the perfect place to start your day and take in the feel of the activist-centered neighborhood. Think baristas in vintage L.L. Bean hats and avocado toast for under $5. Rooftop pool with views of the city at Mason & Rook. Photo courtesy of Mason & Rook. Washington D.C. can still feel very much like a one-industry city, and the hotel landscape reflects that story, with no shortage of mid-range and chain hotels you’ve seen elsewhere, as well as icons of luxury like The Ritz-Carlton, Four Seasons, and Mandarin Oriental. But as far as hotels truly making their mark on the city, serving as a destination unto themselves, D.C. has been slower to the game. The Northwest quadrant is an ideal neighborhood base with no shortage of restaurants and cafes, and an easy distance from the Mall, galleries, and other sites beyond. Kimpton offers a hip yet unfussy boutique offering at their Logan Circle property. The sleek spot features dark intimate interiors, bikes for borrow, and Radiator, a restaurant and bar that is as much a draw for locals as it is for guests. It takes inspiration from the former auto repair shops that used to be ubiquitous along the nearby 14th Street corridor. The food strikes a high note, and even if you just come for drinks, the outdoor fireplaces make staying for just one nearly impossible. 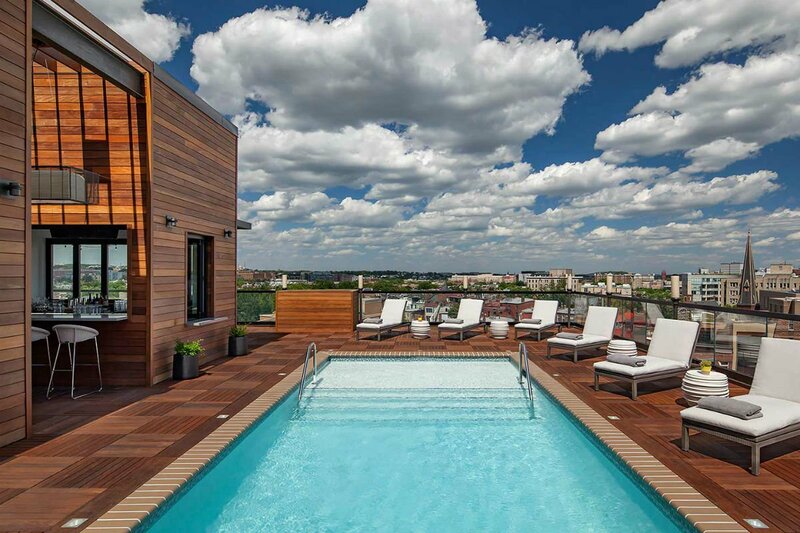 Definitively D.C.’s hippest establishment and perhaps the city’s foremost boutique hotel. Hot to the District, the Line already has an outpost in Los Angeles and another on the way in Austin. Besides being stylistically gorgeous, the 220-room Adams-Morgan property has a serious amount going on. There’s a radio station in the lobby (Full Service Radio), three restaurants, two bars, and a coffee shop. For those in the know, it's the place to stay right now. Cherry Blossoms Aren't the Only Things Blooming in Washington, D.C. Filed under: Culture, Food, Little Black Book, Washington, D.C.
Madeline is a New York City-based writer and the community editor of the online travel magazine The Culture-ist. She is happiest when enjoying a bagel in Central Park on a perfectly warm summer day. You can follow her @madolionw on Instagram and Twitter. She travels for the thrill of feeling fully alive.